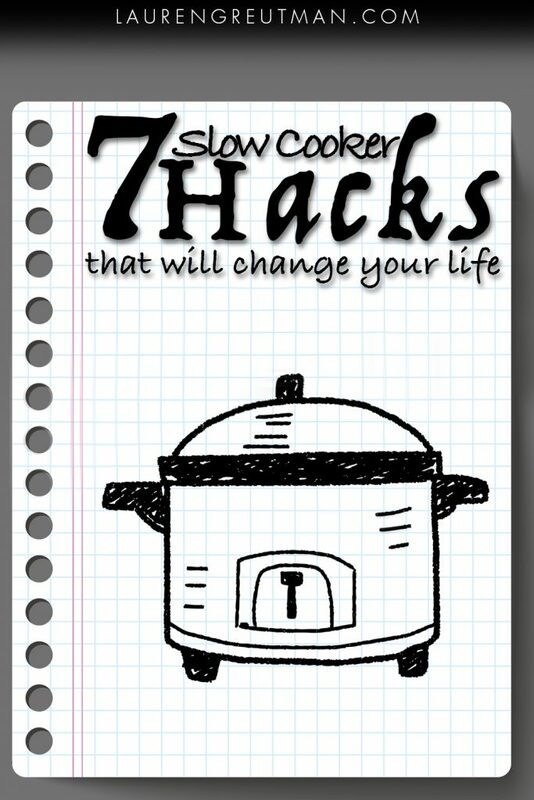 How to use a Crock Pot: 7 Slow Cooker Hacks that will change how you cook! 7 Slow Cooker Hacks that will change how you cook! If you want to know how to use a crock pot to its fullest potential, then you NEED to know these hacks! In case you can't tell, I love my slow cooker. So I love slow cooker hacks and tips that can help you use it to it's fullest potential! And I REALLY love my slow cooker in the summer time. The idea of cooking, without really “cooking”… you know what I mean? That's kinda how it is with my Slow Cooker Meal Plans – where you can create 20 slow cooker dinners in less than 3 hours (trust me – I've done it many times). So last year, I shared 15 Things I Learned by using my Slow Cooker for 100 Days, and you guys LOVED it. I think it's been pinned over 30,000 times. And since then, I've learned a few more tricks and tips… 7 to be precise, I guess. But I'm willing to add more if you have ideas! How to use a Crock Pot to its fullest potential! 1. Bouillon cubes (or chicken/beef base) are a necessity. And my answer is always the same – not recommended. Here's why – when chicken broth is used in regular cooking over the stove, much of the liquid is cooked off to intensify the flavor. When you are cooking using the slow cooker, you are generally stuck with the liquid you have. If anything, you will end up with even more liquid as the meat cooks. This is why bouillon cubes are great. Generally, 1 cube (or 1 tsp base) mixed with 1 cup of water yields 1 cup of broth. But in the slow cooker, I usually drastically reduce the water. And sometimes if something needs a little more seasoning, I'll use a bouillon cube instead of more salt. 2. Chicken thighs are the BEST. Boneless skinless chicken thighs to be exact. Yes, many of my recipes call for chicken breast in the slow cooker and it does work fine in most instances. It's just that chicken thighs are better. Look – slow cookers overcook meat. It's just what they do. If you place a thawed roast in the slow cooker and cook it on low, it will be done all the way to the middle by hour 3. If it's pieces of chicken in the slow cooker on high, they are done by USDA standards within the first hour. But slow cookers go WAY beyond this. The liquid keeps it moist as the meat fibers break down even more. And this process works really well with dark meat chicken… much better than it's lighter counterpart. 3. Dairy works… but you gotta do it right. I've tried lots of recipes using milk and cheese (and I have several on this site and in meal plans) with varying success. Dairy is funny and can curdle when exposed to extreme hold or heat for a long time. The curdle in itself isn't bad, after all, that's where butter and ice cream come from. But for a dish that's supposed to be smooth and homogenized, it can be unappetizing. Why milk can curdle when it freezes: the longer milk is frozen, the more ice crystals form which break the membrane surrounding the tiny fat droplets. Then when it defrosts, the fat escapes from the droplets and floats on the surface. It can also happen if milk is heated- for 2 reasons. Firstly, if the milk is heated to quickly or is boiling, it will separate. Or, if the milk becomes acidic, the proteins in the milk will bond with each other, causing curdling (this is why adding lemon juice to milk creates buttermilk). On another note – when milk gets old and starts to spoil it also becomes acidic. That's why spoiled milk is curdled… but curdled milk does not necessarily mean spoiled milk. Don't freeze it. Freeze all the other ingredients, and then use the dairy on the day you cook the meal. only cook it on low. For best results, add the dairy only at the end. Use some cornstarch when following #3. It will give it a bit of richness and will all but guarantee it will not curdle at all. 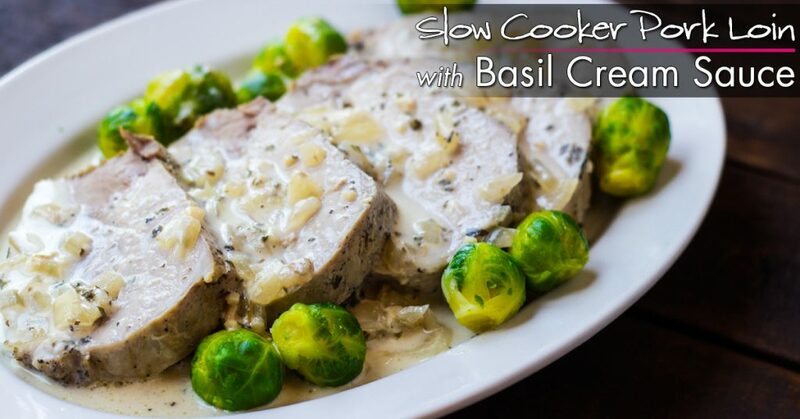 Recipes like Slow Cooker Cilantro Lime Chicken and Pork Loin with Basil Cream Sauce utilize tips 3 and 4 to great effect. And then there are some dairy-heavy recipes that turn out fine even if I completely ignore all of the tips above – like this Slow Cooker Spinach and Artichoke Chicken (which is AMAZING btw). 4. The voltage in your house matters. Regarding liquid boiling, that isn't necessarily a bad thing. 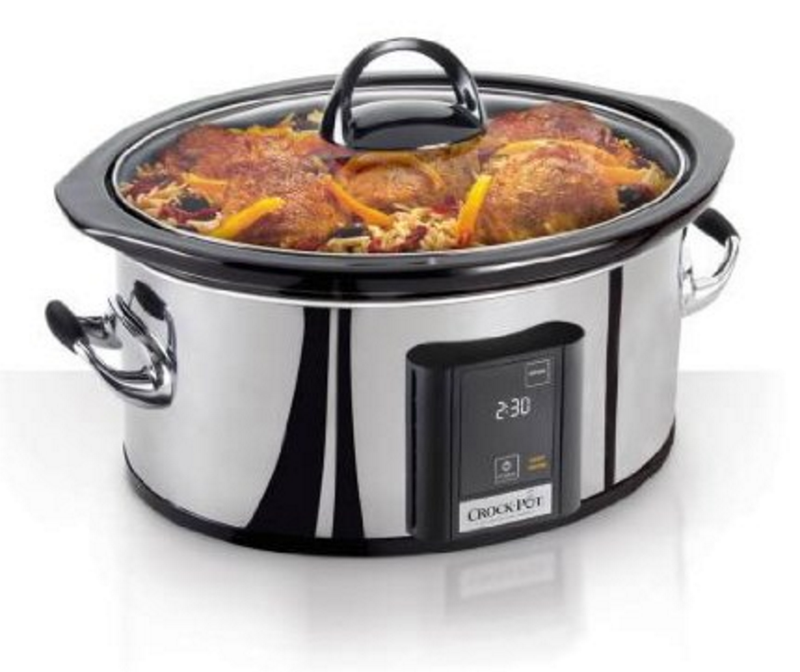 Almost all lower-priced slow cookers will eventually reach boiling even on the low setting after about 3-4 hours. Mine does this sometimes, and my roasts still turn out great. But if you don't want it to boil, Cooks Illustrated did a VERY thorough review of tons of slow cookers, and determined that the Crock-Pot with Programmable Touchscreen, model SCVT650-PS had the best performance in terms of temperature. On low, the liquid reached a maximum and sustained temperature of 199. But then others that get REALLY hot and scorch the bottom of the food. That's a problem. Even the cheapest slow cookers should regulate the temperature enough for that not to happen. But if that's happening to your food, there is a good chance you are getting too much voltage going to your slow cooker. Here's a hack for this problem (albeit one I haven't tested… but this guy did and it seemed to work!) – get a variable transformer. It's not cheap, but it will allow you to limit the volts going to your slow cooker. On the other hand, you might have low voltage, and your slow cooker never quite gets up to temperature. This happened to me camping once. My pork roast was on medium for like 10 hours and never really cooked all the way… it was disappointing, but not surprising that the pavilion in the middle of the woods wasn't up the task voltage-wise. 5. Thickening liquids is great. But follow one of these 2 methods. We all love a nice gravy or thickened sauce with a meat and veggie based dinner. But the slow cooker can be not-so-good at this. Once common method many have used to make thickened sauces in the slow cooker is the easy way – canned ‘cream of whatever' soups. Sure, you could do this. But I try to keep ingredients as real as I can. Canned cream soups have tons of emulsifiers and other ingredients… LOTS of other ingredients. I know what you're thinking – but you're okay with bouillon cubes?! Yeah, I guess that's where I draw my line. There are MANY more ingredients in canned cream soups than in bouillon cubes. But that's just me. 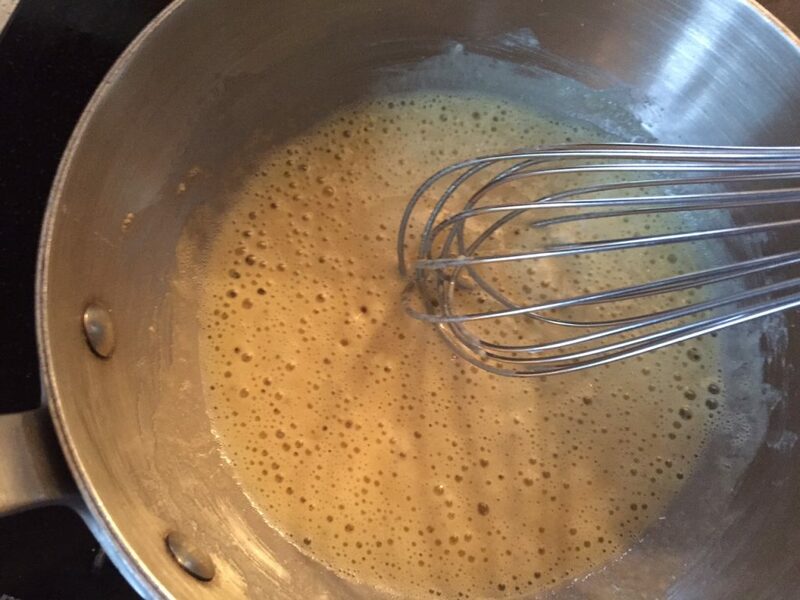 Make a roux – equal parts butter (unsalted is best) and flour. Whisk to blend completely, and cook longer if you want it darker. Then add a bit of milk for a béchamel sauce, which is technically what I usually make before adding to my recipe to thicken. Cornstarch – this method is easier. Whisk anywhere from 1 to 4 Tbsp of cornstarch (depending on how thick you want it) with 1/4 to 1/2 cup of water. Heat over medium in a small pan and add some of the liquid from the slow cooker to the pan. Continue to heat and and whisk and you will see it become a very thick. In either method, it works best if you add the thickening agent to the slow cooker and mix it in well with the other liquid. Cook for another 20 minutes or so. 6. Dried spices are better. Don't bother spending extra money on fresh basil, oregano, parsley, or anything else. Just use the dried stuff. You heard that right… and as someone who likes to cook, it really pains me to say that. But with the slow cooker, it's true. You know what happens to fresh spices in the slow cooker? They get cooked to DEATH. All those awesome benefits of using fresh spices – the aroma, the texture, the beautiful color on the plate – they completely disappear when you cook them in liquid for 6+ hours. Just use the dried stuff. It has amore concentrated flavor anyway – which works well with this type of cooking. But using fresh spices as garnish on top as your meal is plates – that still works great! 7. The best meats are generally the cheapest meats. This tip is basically a generalization of #2. Meats that are tough, maybe a little fatty, and have inter-muscular tissue tend to be inexpensive. Part of the reason for this is that the USDA has been pushing ultra-lean meat for decades, so boneless skinless chicken breast is what people buy. But for the slow cooker, you can do a lot better and spend less doing it. Pork shoulder, beef brisket, pork shank, chuck roast, chicken thighs – these are all AMAZING in the slow cooker and have TONS of flavor. Much more so than their leaner counterparts. But the key is that you want them to be braised (ie cooked for a long time in liquid) – which is what the slow cooker does. Cuts of beef suitable for the slow cooker have a lot of collagen. Collagen is rubbery and can make the meat tough. If you cook it too hot and fast, it will only tighten up even more. But if you cook it “low and slow”, it will liquify and also lubricate the cooked meat fibers. Lubricated meat fibers. Ok that just sounds wrong. But you know what I mean. Don't forget to check out 15 other things I learned about using my slow cooker for 100 days! So what hack or tips do you have?! Thanks for bloging this. I have been looking for some kind of answer about the crock pot. I have two of them. About 6mo ago I bought a bigger, newer one and Ive only used it once or twice….because it cooks way too fast. So does my older other one. Ive heard lots of people complain about this but not too many answers. 1 other person also talked about the transformer but at $65…which is even more then the crockpot cooks recommended…i would be better off just buying another crockpot. Oh yea and so far I have had the same problem with them over cooking in every house/apt I have moved to. Just makes me wonder if its a wattage problem with the house…..or with the crock pots? I use an automatic wall timer. Great if you work or have errands to do. Just plug timer into wall, crock pot into timer, set start and stop times. You never have to worry about over or under cooking. Do you crumble up your bouillon cubes before adding them to the bag? Nope – i just throw them right in whole.